In my neon leopard post, I mentioned a nail polish company called Soo Nails. They are super cheap (no more than $3) and are a decent quality. Today I wanted to show another polish from them. 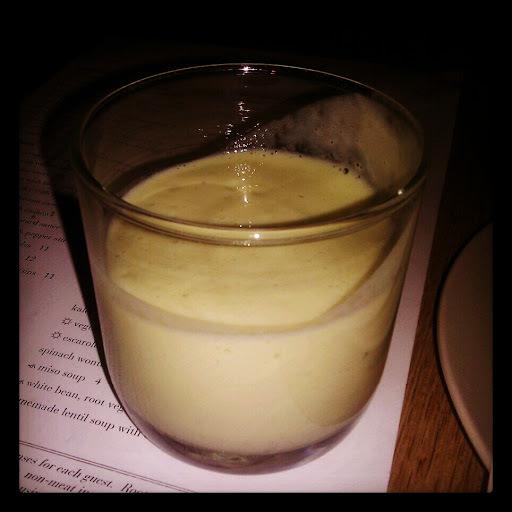 This one is called # , if I were to name it, I would call it Avocado Milkshake. It totally looks like the avocado milkshakes my husband makes. But enough about that, lets talk about the polish... # is a yellowed green creme color. The application on this was great! I only had to use two coats, it wasn't streaky at all. I don't have any dupes of this in my collection but it looks like Sinful Colors Adventure Island, at least according to swatches I found online. If you know of any other possible dupes, let me know. Please excuse the lobster hands! I swear my hands do not look that red in real life... I really love this color, it's not your traditional "pretty" color. Next time, I'll see how it looks with glitter over it. And since I mentioned avocado milkshakes, let me explain how delicious they are. Mr. R. hails from Brasil, where avocados are treated as fruit, and are mashed with sugar and cream, made into mousses, or milkshakes. To me, I always eaten them as a savory side like a slice with rice and beans (very Puerto Rican) or my Abuela's homemade guacamole (the only exception). I was never a HUGE fan of avocados (the irony of growing up with an avocado tree in my grandparents' backyard). Needless to say, it blew my mind when Mr R declared he was going to make an avocado milkshake... I have since enjoyed many a shake since then. Then blend all of the ingredients together. That's the basic recipe. However you can tweak it and make it your own. I sometimes like adding a banana and vanilla protein powder, other times I add a little bit of Nesquik. One thing, I recommend making a large batch and freezing what you don't use. Otherwise the avocado oxidizes and doesn't look pretty. I'm slowly coming around to that point, haha. I heard about using avocados in veggie smoothies (if you are a health nut like me), it makes the consistency really nice and thick! Yeah, this makes for such a creamy shake, it's perfect for dessert. thank you! I'm not usually into cremes but the color drew me in. I have never tried avocado milkshakes. You should try it, very tasty. Let me know if you do! Please let me if you've tried it! It's so yummy. Avocado milkshakes?! That's BRILLIANT! That has never occurred to me... I'm writing down that recipe and buying some avocados the next time I'm at the store. Can't wait to try it. The mention of avocado milkshakes might have overshadowed it, but I do really love your polish... I adore the milky yellow/slightly green look. Gorgeous. I wonder if it's similar to the OPI shrek release from a while back... I think it was a green tone yellow called Fiercely Fiona. This seems a bit brighter and more pastel going from memory, but I could be wrong. Lovely, anyways! Let me know if you've tried it. At first I thought it was a weird concept but now... I thought Fiercely Fiona may be a dupe but the swatches online make it look brighter? Hmmm, I've never had that happen. I wouldn't like it either, but maybe try it again. Buen Provecho! I dont like avocados... but i did do an avocado mask on my hair this week... AMAZING! Thanks, I'm glad I picked it up. I haven't done an avocado mask in a while but aren't they great? I've definitely come across bad cheap polishes. Thankfully this color wasn't one of them. Since it was a creme, removal was super easy. OMG!! I totally forgot about Avocado milkshake!!! My mom used to make it when I was little and I haven't had it for yeaaaaaaaaaaars!!! I really gotta fix this soon!! Thanks so much!!! Doooooooo it! My friend also makes ice cream with avocados and coconut milk, it's amazing. I'm also in love with either milky colors or neons, haha. Let me know how you like them, I've never had any problem with application with this brand. I only wish they had more info, at least a website. Ohh, nice color. It really does look like avocado milkshakes. daaaahhhlinggg, I'm so glad i'm not the only one familiar with Soo Nails!!! Isn't it a fabulous brand?? The quality is superb and the price?? I hardly ever use anything else! !